I remember the shorts so vividly because I’d always leave the orchard with war scars: tight burnt skin on the back of my little thighs and at least one bruised shin. But every year, I would mount the skinny and very old metal slide that was responsible for those marks. I didn’t like slides much as a kid. But I think I knew that if I tired myself enough from climbing and sliding over and over until I’d no longer have a sense of equilibrium, I would be hungry enough to get an apple dumpling at the snack shack, even after eating way too many regular apples out of hand. I had free rein; there never seemed to be other kids trying to use the slide. It could have been the yellow jackets that circled its weed covered legs or how intimidating my sliding prowess was, but I’m thinking the former is probably true. I only remember two snacks at the Brookfield Orchard’s shack: hot or cold cider and apple dumplings. I’m sure there were others, but why bother? Apple dumplings were offered hot or cold; à la mode, with slice of white cheddar, or both. Served with two scoops of ice cream so yellow and light in texture that they had to be the Hood Golden Vanilla (“flavored”) Ice Cream that my grandmother used to buy. 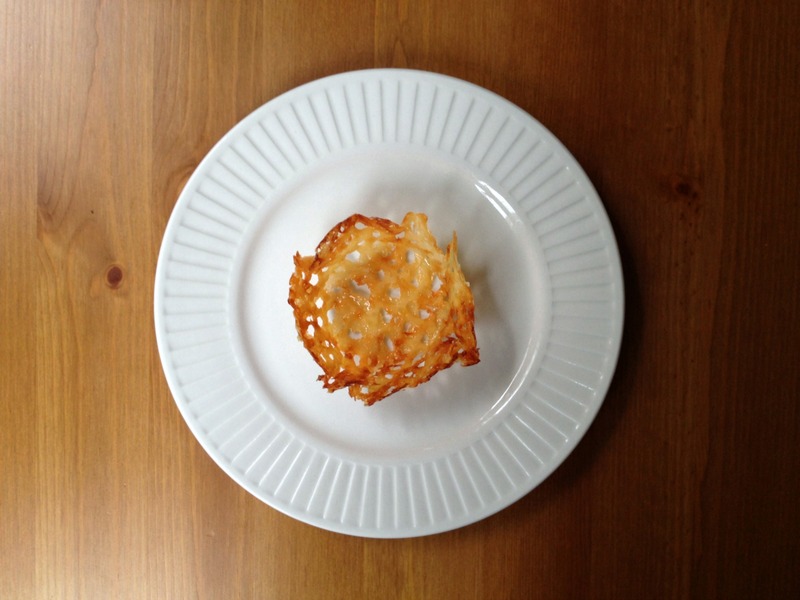 But when served with that wedge of semi-pungent white cheddar, the dessert packaged all that it means to be Yankee in a flaky crust and it was my first introduction to the very popular and very New England combination of apples and cheddar. I guess a fondness for the fall of my childhood—the adventures, the suburbs, the cleaner air—inspired this adult dessert. I hate to call it a dessert, because while it fits very squarely in the dessert category for me, it may be savory for those with sweet teeth. 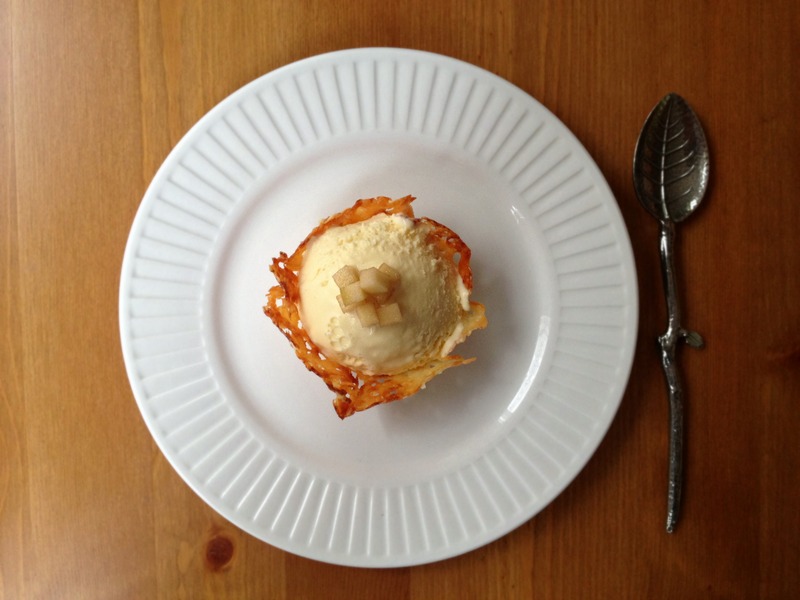 A lacy and crisp aged cheddar tuile cup encases an apple ice cream that’s made with reduced local orchard–fresh cider (cooked down apples make for a too-dense dessert), and a topping of a small amount of pickled fine-diced apples whose acidity cut through the double-dairy richness of cheese and ice cream. The very same songs probably played on the way home, but there’d be less singing; beat, we’d rather stare out the windows at the orange, the warm but crisp air tangling locks and fluttering eyelashes. The better you cider is, the better the ice cream will be. Unfiltered apple cider vinegar makes the best-tasting pickles. I reduced the cider in a 10-inch nonstick skillet. 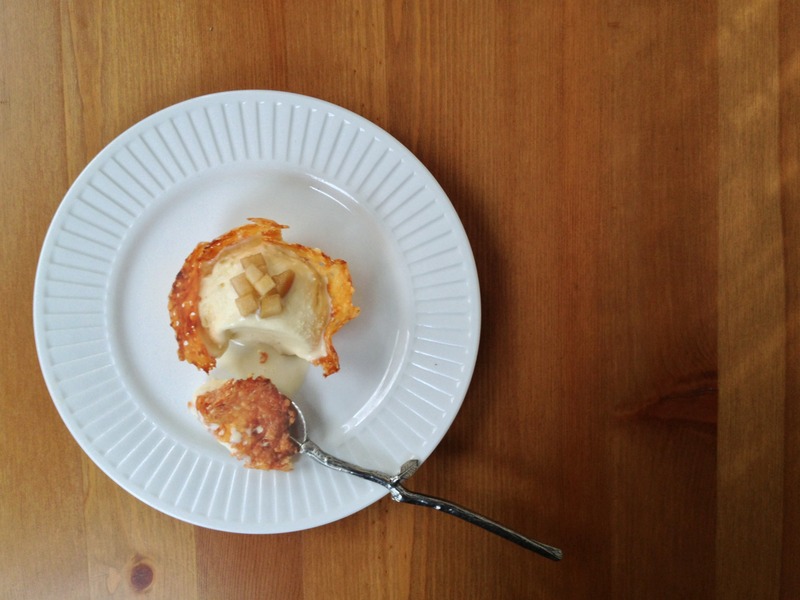 For a crisp tuile cup that breaks cleanly, you need to use a crumbly, dry aged sharp cheddar. Ask your cheese monger for a recommendation as the amount of years aged doesn’t always correlate with the dryness of the cheese. I used Cabot Clothbound cheddar for this recipe. If you’re using a conventional sharp cheddar that’s not dry, add a pinch of sugar to each cheese pile and bake until brown, not just golden. 1. 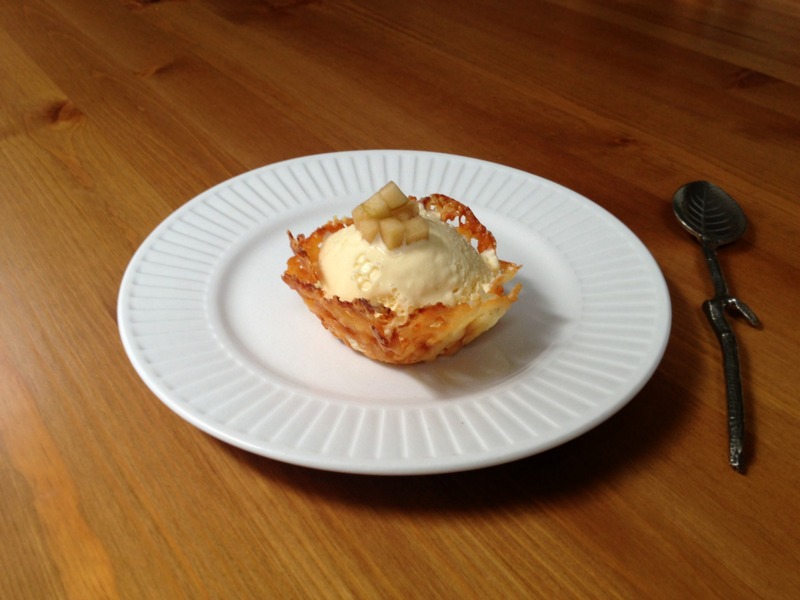 For the ice cream: Place 230 grams (1 cup) heavy cream in medium bowl with strainer set on top. Bring 230 grams (1 cup) heavy cream, milk, 2 tablespoons sugar, and salt just to boil in small saucepan over medium heat. Meanwhile, whisk egg yolks together in large saucepan. Set up ice bath in large bowl. Pour small amount of hot milk mixture into egg yolks, whisking constantly, to temper, then slowly whisk in remaining cream mixture in steady stream. Cook mixture whisking constantly, over medium heat until line drawn down custard-coated spoon holds and custard registers 170-175 degrees. Pour custard through fine-mesh strainer into cream and whisk to combine. Transfer bowl to ice bath and whisk occasionally until mixture reaches room temperature. Cover bowl with plastic wrap, transfer to refrigerator, and let chill for at least 8 hours or up to 24 hours. 2. While custard is chilling, combine cider and remaining 6 tablespoons sugar in shallow and preferably nonstick pan and cook over medium-high heat, stirring occasionally and scraping sides of pan, until mixture starts to boil vigorously, about 15 minutes. Reduce heat to medium-low, and cooks, stirring frequently until mixture measures right between ½ cup and 2⁄3 cup Let cider syrup cool completely. Transfer chilled custard and cider syrup to food processor (process in batches if necessary) and process until smooth. Return custard to bowl and refrigerate 1 hour. Stir Apple Jack into custard if using. Churn ice cream in ice cream machine according to manufacturer’s instructions, 15 to 30 minutes (Ice cream will be ever-so-slightly softer than normal because of the inclusion of a cooked sugar syrup.) Transfer ice cream to container and freeze for at least 4 hours before serving. 4. For the Pickled Apples: Place apple in bowl. Bring cider vinegar, water, sugar, cinnamon stick, and salt to boil in small saucepan, stirring to dissolve sugar. Pour brine over apple and let sit until mixture reaches room temperature, making sure that apple is completely submerged. Transfer apple and brine to cover to airtight container or jar and refrigerate for at least 1 hour or up to 3 days. 5. For the Cheddar Cups: Adjust oven rack to middle position and heat oven to 350 degrees. Line baking sheet with parchment paper. Shred cheddar into ½-ounce piles (you can make as many or as few as you’d like). Transfer pile to prepared baking sheet using measuring cup and shape into thin circle, smoothing more cheese to the edges than in the centers. Bake until cheese rounds turn uniformly golden brown. Let rounds cool on sheet until they can be picked up by an offset spatula (30 seconds to 1 minute depending on how aged your cheese is), and then quickly mold over bottom of glass or other round object to create bowl. Pat with paper towels if necessary and let cool completely. 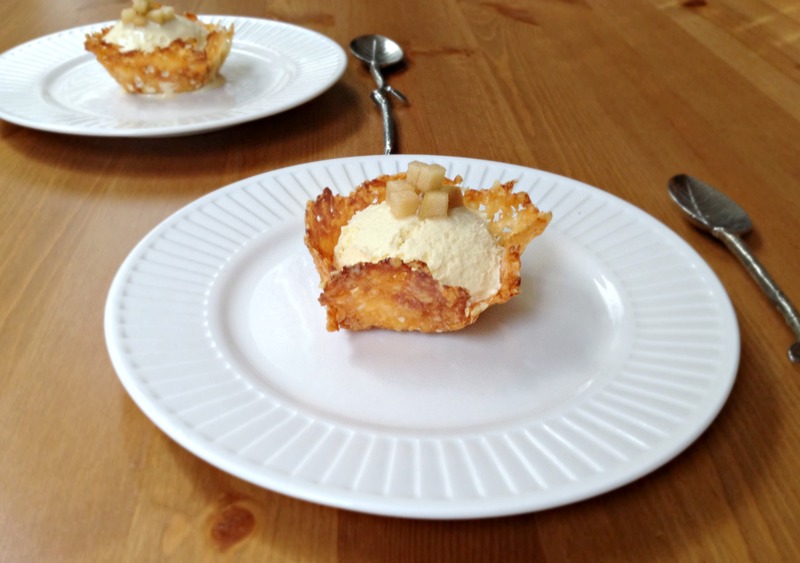 Serve ice cream in cups, topped with a bit of pickled apple. I love reading about that memory from your childhood. I like apples and cheddar together, and would definitely love this! You know, although I’ve read about the apple pie and cheese combo my entire life, I don’t think I’ve ever eaten it. It’s just not a combination one ever sees in the South. But this? Oh my! Now I get it!